Got the cutest Mini Schnauzer in the world? Of course you do and now's your chance to prove it! 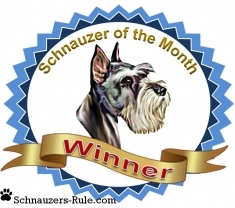 Just submit your very best Miniature Schnauzer pictures along with a story (minimum 150 words) in our Schnauzer of the Month photo competition for a chance at winning fame & fortune. Well, we can't promise fortune but you will receive a bit of fame as each winning Mini Schnauzer photo will be featured on our website's homepage for all the world to see..... AND photo entries become eligible for inclusion in our up & coming Schnauzers Rule calendar! OR your photo may be created into one of our Schnauzer Dog e-cards! OR in some other way to show the world just how cute you are! Heck you really might just become FAMOUS!!! 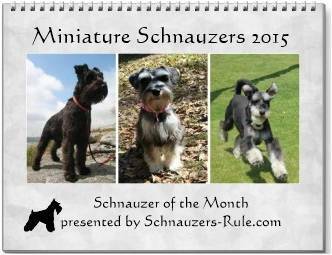 Monthly Schnauzer winners have the opportunity to be featured in our yearly calendar. And so you never miss out on our announcements, dog training tips, dog news, and other dog prizes & giveaways, be sure to sign up for our once-a-month ezine... 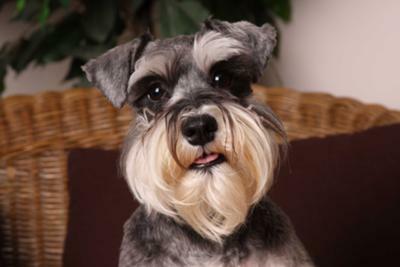 The Schnauzer Scoop and/or subscribe to our Miniature Schnauzer Blog! 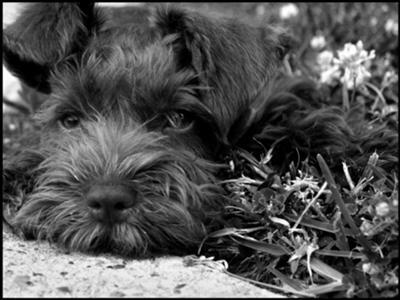 Go to the Miniature Schnauzer Photo Entry Form and fill in all the required information, including a story about your dog (like your dog's habits, favorite toys, treats, daily routine, personality, info about the pictures you are submitting, etc...) plus your best Miniature Schnauzer photos. Please Note: All stories MUST BE a minimum of 150 words for entry approval. Unique content and word count per page affects our Google ranking, therefore any entries received with less than 150 words will not be considered. note: Be sure to read the official rules BEFORE entering! Winning Schnauzer photos are chosen by a panel of judges whose decisions are final. Judges are looking for high quality Miniature Schnauzer pictures and Mini Schnauzer puppy photos. Winning dog pictures may appear on this web site and/or on any promotional materials or merchandise offered by Schnauzers-Rule.com without further notice or consideration. See Submission Guidelines. Keep in mind: Judges pay special attention to mood, lighting, action shots, unusual pictures, beautiful portraits, etc. All entries must include a story about your Miniature Schnauzer and/or description of the photos submitted (150 words minimum). Avoid being disqualified: Make sure dog pictures are in focus! Avoid cluttered backgrounds and most importantly make sure your photos DO NOT include any recognizable people (unless otherwise specified in a particular themed event posted in the rules, herein). This is a Miniature Schnauzer contest after all. How to Take Dog Pictures: Learn how to take great dog pictures of your Miniature Schnauzer.Click on the link to get all our tips for taking fantastic pet photos worthy of framing and winning a prize! The picture below is one of our previous winners DAISY! PHOTOS MUST BE IN FOCUS for Calendar: Photos must be of good quality in order to be featured in our yearly calendar. If a winning photo for any particular month does not meet the criteria to produce a quality product, another Schnauzer photo of better quality submitted from any given month will be used instead for the yearly calendar.